I didn’t expect to like this issue as much as I did, primarily because of what happened in issue #61. 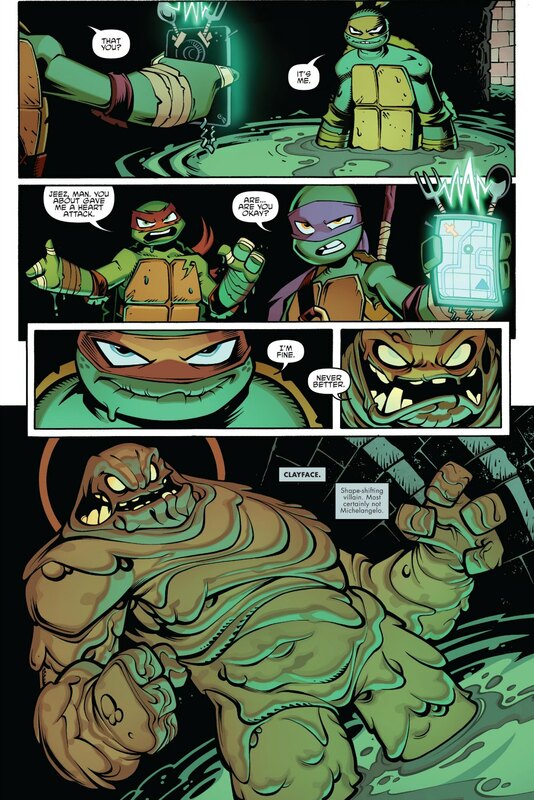 I’ve called that “the meeting issue,” because it contains one of the oddest scenes I’ve ever seen in a TMNT book. It’s essentially a big war council scene with all the good guys talking strategy. The promise of all these characters being together for a Christmas party, along with my general distaste for “Christmas episodes” (bah humbug), made me nervous. Thankfully, this story about a Christmas party stays fairly upbeat, and weaves in some nice character work. The boys in green are more in need of holiday cheer than ever. They now find themselves estranged from their Master Splinter after the events of issue #64. 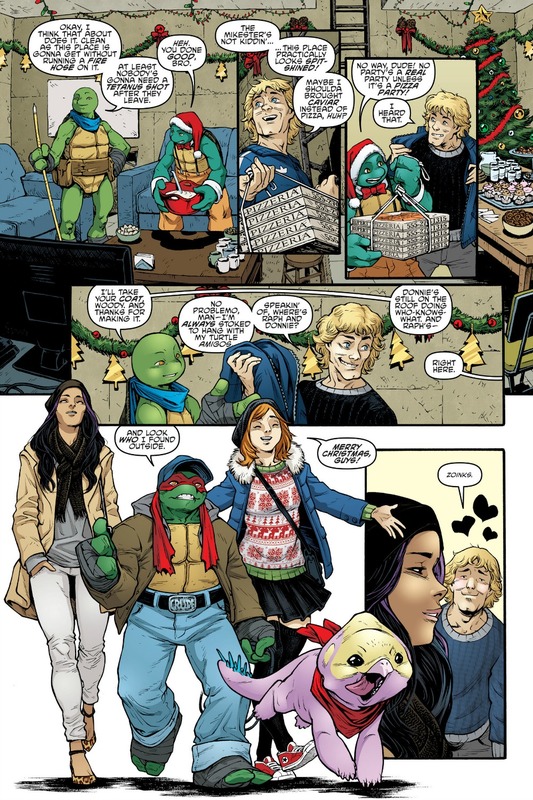 Mikey throws a Christmas party in an attempt to boost morale. But one question remains unanswered: Who invited the Mutanimals? Mateus Santolouco is back on the pencil for this issue. I’ve been a little critical of him in recent months. But given how long he’s worked on this series, his art does feel like a homecoming of sorts. Santolouco is also tremendous at injecting excitement and enthusiasm into his characters. Look at Mikey on the cover. Look at the way he draws Pigeon Pete. Cartoony? Yes. But also a lot of fun. This issue was also my first exposure to Pepperoni, Raphael’s pet baby dinosaur. Having skipped Turtles in Time and Bebop and Rocksteady Destroy Everything, I was woefully unprepared for this little pink creature running around. On the upside, Santolouco makes him an adorable addition. While I’ll keep things spoiler free, Splinter makes a brief appearance in this issue. Tonally, it’s odd. We left things in a very somber, painful place with Splinter last month. This month he’s feeling rather…Christmasy. It’s a cool idea. But Splinter is the one character I would have kept immune to all this holiday cheer. This issue also introduced Angel/Nobody to Woody the pizza guy. This had sort of a Steve-Urkel-meets-Laura-Winslow vibe to it. (Look it up, kids.) This could very well have been a one-off. But it was charming enough to merit a revisit down the road. 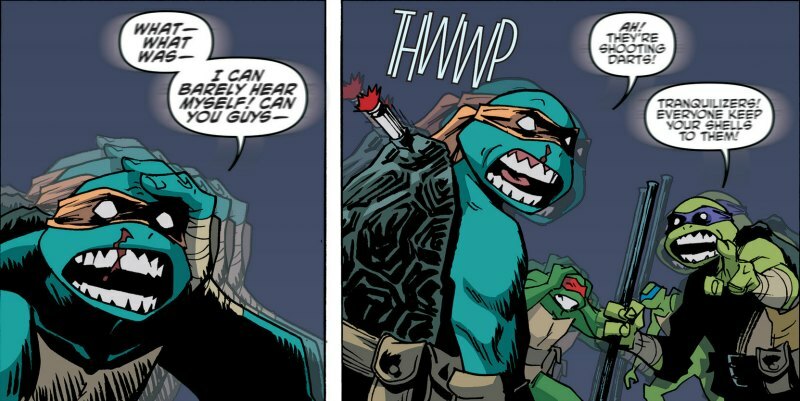 TMNT #65 was a nice bit of levity, and a break from the intensity we’ve had in the last few months. Though I suspect next month we’ll crank that intensity right back up. So we may want to enjoy this respite while we can. 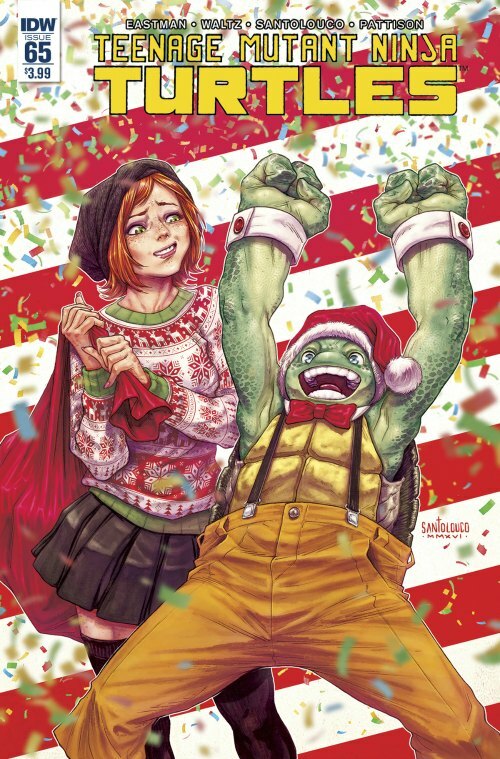 This entry was posted in Comic Books/Graphic Novels and tagged April O'Neil, Bobby Curnow, Christmas, comic book reviews, Donatello (TMNT), IDW Publishing, Leonardo (TMNT), Master Splinter, Mateus Santolouco, Michelangelo (TMNT), Mutanimals, Ninja Turtles, Raphael (TMNT), Rob Siebert, Ronda Pattison, single issue reviews, Teenage Mutant Ninja Turtles, Teenage Mutant Ninja Turtles #65 (2016), Teenage Mutant Ninja Turtles (IDW), TMNT, Tom Waltz on 12/27/2016 by primaryignition. 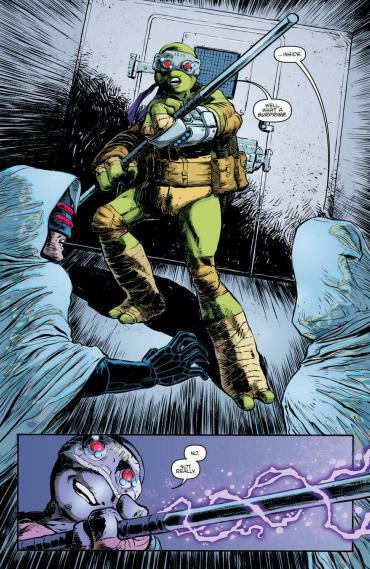 This one was a head-scratcher, and not the first one TMNT has turned in since this whole “Splinter leads the Foot Clan” thing started. What we have is an issue that starts out very strong, builds to fitting climax, and then veers off in an unexpected direction. It’s not necessarily a good direction, either. It’s almost like taking a swig of orange juice after brushing your teeth. In Teenage Mutant Ninja Turtles #64, our heroes storm the base of Darius Dun and the Street Phantoms, hoping to rescue their ally Harold. But in the process, things go south. Allegiances change, and more importantly, families are split apart. Let’s jump right into spoiler territory, as that’s where my main point of contention with this issue is. 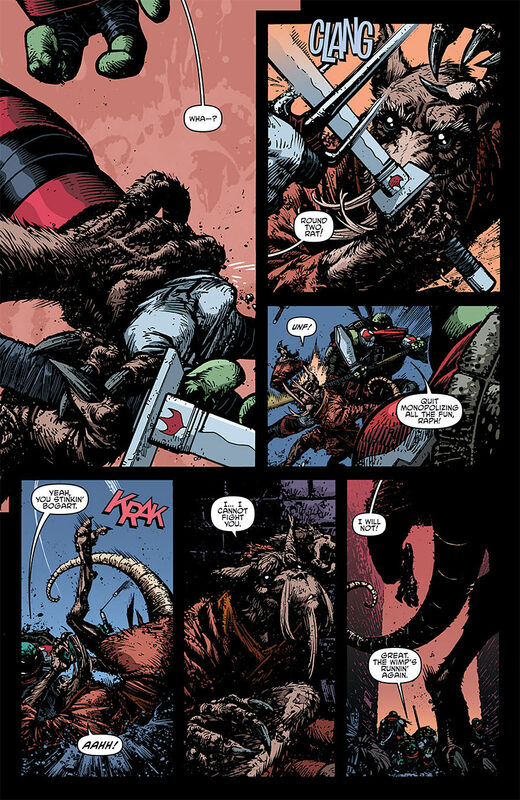 During the climax, Splinter has Darius Dun killed. This leads Don, Raph, and Mike to immediately leave the Foot. 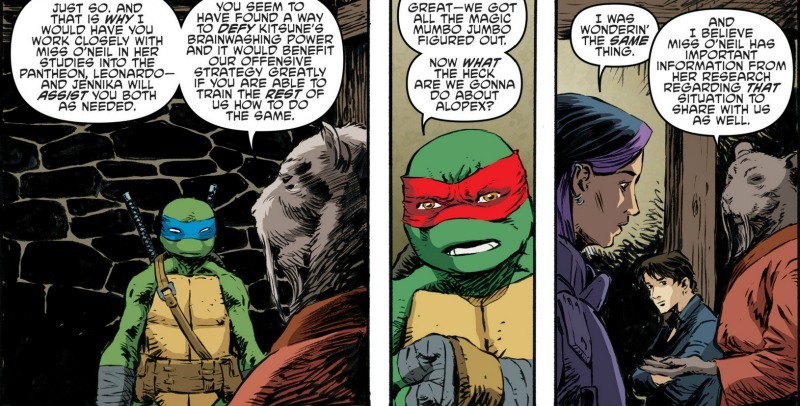 Splinter tells Leo that the Turtles aren’t safe by his side now that he leads the Foot Clan, and he’s been resorting to drastic measures to break their loyalty and push them away. As you see below, the exchange ends with Leo saying he understands, and walking away. I’m glad he understands, because I’m not sure I do. 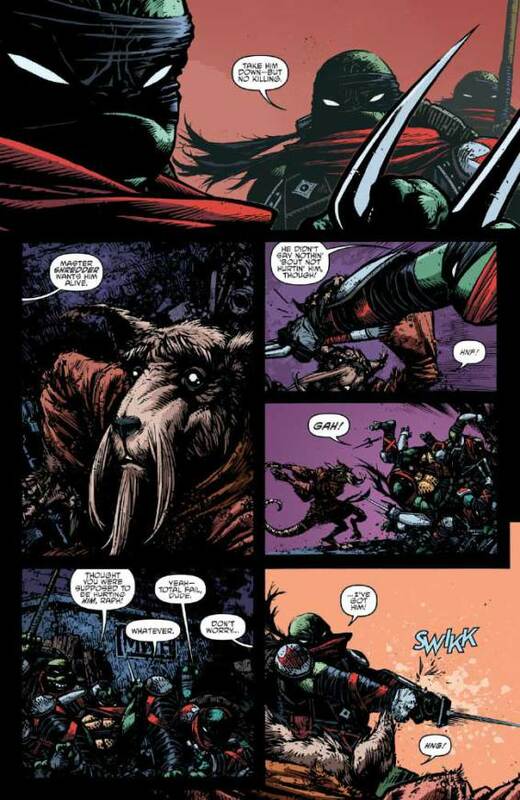 Let’s unpack this: So Splinter’s end game, at least recently, has been to keep the Turtles safe. So why make this move now? Why not back when you were going against the Foot Clan? Why not when Donnie had his brush with death? Why not after they were reunited with Raph way back in issue #4? This entire ninja crusade was Splinter’s idea to begin with. But now that he’s in a position to control the enemy forces from within, he’s suddenly got cold feet about the whole thing? So much so that he’s willing to alienate himself from his sons? It all feels very forced. I can only assume there’s something else going on that we don’t know about. Otherwise, you’d think Splinter would know what the readers already know: This will only lead to the Turtles coming back to try and save Splinter from himself. As it’s still so fresh, I’m hesitant to judge this development too harshly. But this feels like a case where an extra line or two would have done wonders. We can’t tell just how much Splinter is second-guessing himself at this point. But something like “I’ve gone too far” seems appropriate. Adding to the awkward nature of this scene is the build-up to it, which is really actually really good. In the opening scene, Casey Jones explains Splinter’s plan to make him the leader of the Purple Dragons, “to help you guys run the city after we trash the phantoms.” The letterer emphasizes that word run, and for good reason. It’s rare that a single word literally makes a scene. But there you have it. We also have some nice stuff between Harold and his estranged ex-wife Libby. Harold’s been around for awhile, and has been a nice supporting techie character. But I never expected they’d give him this sort of depth. It all comes about quite organically. It’s a pleasant surprise. While I’m still picking on him over the whole bandana/beak thing, Dave Watcher has become one of my favorite TMNT pencillers in recent memory. His stuff has a sketchy quality to it, which for me evokes memories of the original Kevin Eastman/Peter Laird stuff. His renderings of Harold and Libby make the scene very accessible. He’s also very good at drawing TMNT tech. Look at what Libby’s wearing in the above panel. It somehow looks believable, doesn’t it? I’m not much of a variant cover guy. 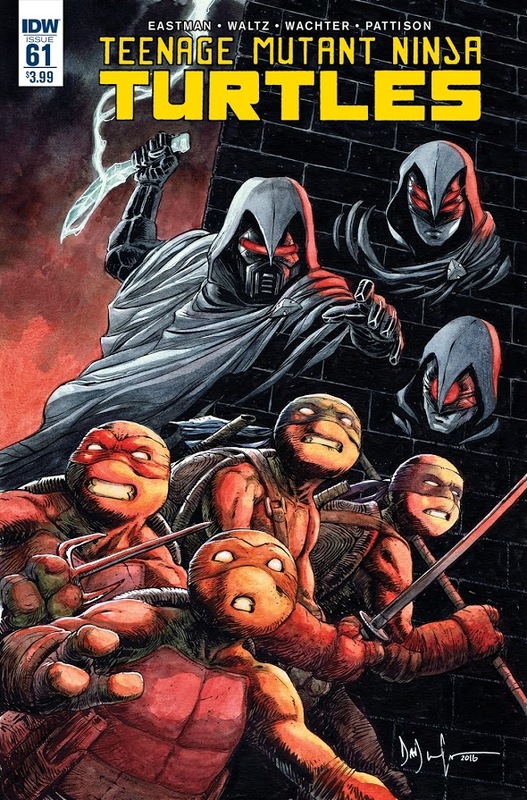 But I almost always make an exception for the ones Kevin Eastman does for this book, such as the one shown above. I love the concept, and I love how shadowy and moody it is. The one thing I don’t love? Splinter’s tail. It’s curvature is too sharp, and it pulls you right out of the scene. After all this time, I still maintain that this TMNT crew missed a huge opportunity by not taking advantage of what they established early on with Raph. Unfortunately, what we’re presented with in this issue could be just as big a misstep. We need more information on why Splinter is doing what he’s doing, or this story might lose a lot of punch. But I’ll give them this much: They’ve got me coming back for next issue. 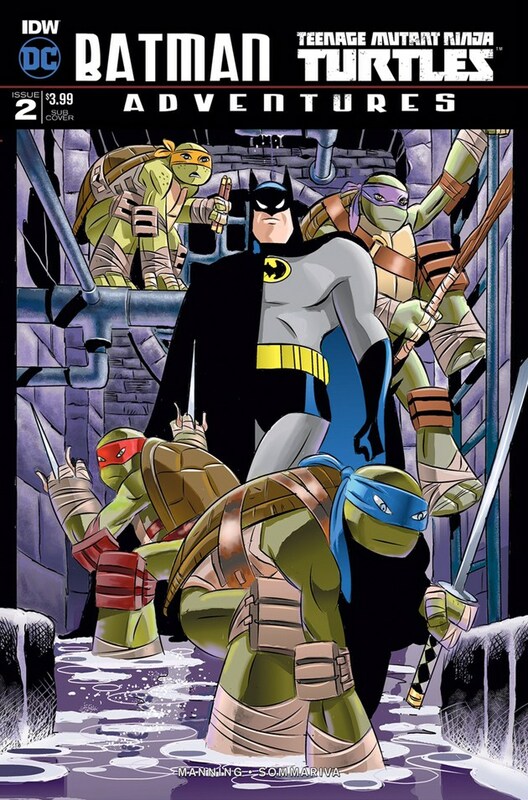 This entry was posted in Comic Books/Graphic Novels and tagged Bobby Curnow, Casey Jones, comic book reviews, comic books, Dave Watcher, Donatello (TMNT), IDW Publishing, Kevin Eastman, Leonardo (TMNT), Master Splinter, Michelangelo (TMNT), Ninja Turtles, Raphael (TMNT), Ronda Pattison, single issue reviews, Teenage Mutant Ninja Turtles, Teenage Mutant Ninja Turtles #64 (2016), Teenage Mutant Ninja Turtles (IDW), TMNT, Tom Waltz on 11/27/2016 by primaryignition. PENCILLERS: Damian Couceiro, Bill Sienkiewicz, Eastman. 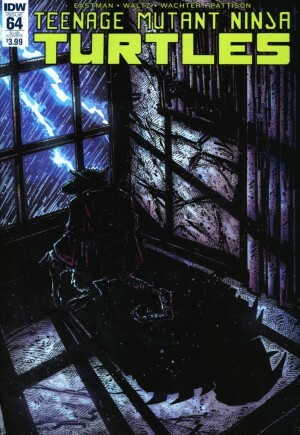 Cover by Freddie E. Williams II. 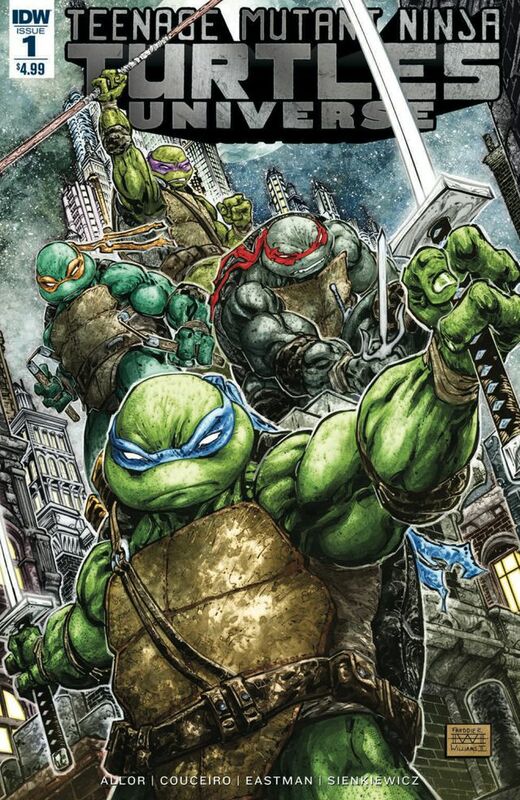 Bobby Curnow, Tom Waltz, and the crew at IDW have been creating good to great TMNT comics for several years now. This new Teenage Mutant Ninja Turtles Universe series opens the door for even more. If this freshman issue is an indicator of things to come, we’ve got mostly good things ahead of us. The Turtles and April O’Neil are hoping they can make an ally of Baxter Stockman. But Agent Bishop and the Earth Protection Force are in hot pursuit of the boys in green. Our heroes will soon find themselves in a fight to survive. Then in our back-up story, Leo faces off against the Foot Clan by himself. Despite his skills, he may be hopelessly outnumbered. 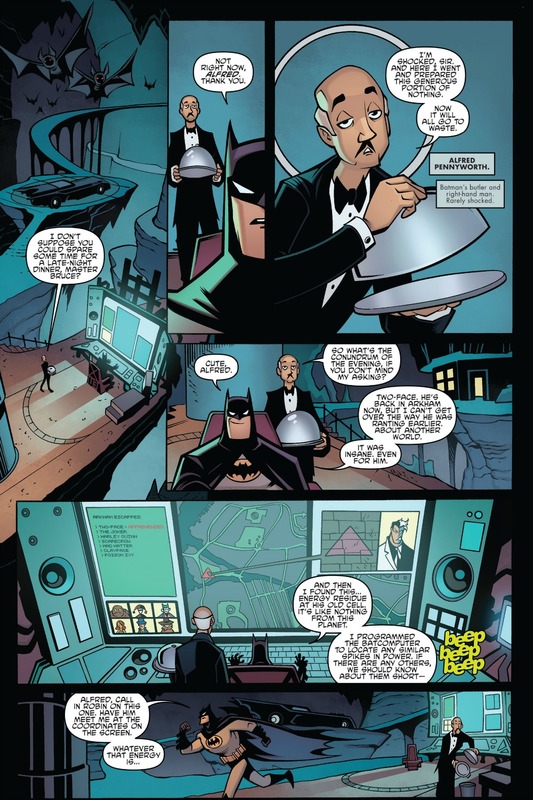 Paul Allor is no stranger to the Turtles, having written a number of their adventures for IDW. His experience is evident here, as he writes a damn good opening page. We get a glimpse into Bishop’s psyche, and why he opposes mutants the way he does. It’s a misguided, though relatable sentiment. Allor uses this first issue to remind us that the Turtles, and mutants in general, are isolated and at times hated. Though Bishop’s motivation, while villainous, is relatable in its own way. As one might expect, the most emotional reaction we get comes from Raphael, and it’s used effectively to close the issue. Allor also isn’t bad with the repartee between the Turtles. Panels like the one above aren’t exactly dripping with wit. But they’ve got a nice charm to them that we don’t always have time for in the main TMNT series. Couceiro, who’s on both the pen and inks for this issue, is a solid fit for the Turtles. He’s got a really nice command of light and shadow, which obviously bodes well for our shadow-bound heroes. He also doesn’t draw their bandanas too large, which I tend to chide Mateus Santolouco, and more recently Dave Watcher for. I do, however, have one thing to nitpick: His Turtles are very toothy. He draws toothy Turtles. Panels like the ones below actually take me out of the story, as I can’t help but stare at their teeth. On the plus side, they’re very white. Splinter must have gotten the boys good dental insurance. Our back-up story is about Leo trailing a Foot ninja, who as it turns out, has some friends. A lot of friends. When I initially read this story, I thought it was scripted by Kevin Eastman. Leo’s inner monologue reads like one of the original Mirage books. He seems more like an easy going teenager, and less like the disciplined leader we usually see. But the issue credits Tom Waltz for the script. I’m not sure why Leo is so casual here. It almost strikes me as out of character. This is also a premise that’s been done to perfection in both the original Eastman and Laird series, and the IDW series. It’s Leo against a bunch of foot ninjas. This story is set to continue next issue, so hopefully they do something with this concept we haven’t seen before. Eastman handles the page layouts, slowing the pace a bit to take us into the action. Bill Sienkiewicz and colorist Tomi Varga are a good fit for the Turtles, providing the gritty, street-level feel the story needs. Like many things in life, this issue reminds me of a line from Star Wars. In the original 1977 film, Obi-Wan says to Luke: “You’ve taken your first step into a larger world.” In a sense, that’s what Teenage Mutant Ninja Turtles Universe #1 is. 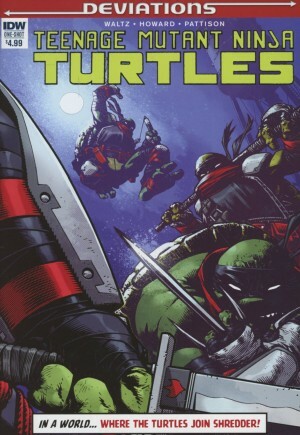 Chances are good that this series will really enrich what IDW has created for the Turtles. Dare I say, cowabunga? This entry was posted in Comic Books/Graphic Novels and tagged April O'Neil, Baxter Stockman, Bill Sienkiewicz, Bobby Curnow, Damian Couceiro, Donatello (TMNT), Freddie E. Williams II, IDW Publishing, Kevin Eastman, Leonardo (TMNT), Mateus Santolouco, Michelangelo (TMNT), Paul Allor, Raphael (TMNT), Star Wars, Star Wars: Episode IV - A New Hope, Teenage Mutant Ninja Turtles, Teenage Mutant Ninja Turtles (IDW), TMNT, TMNT Universe #1 (2016), TMNT Universe (IDW), Tom Waltz, Tomi Varga on 09/11/2016 by primaryignition. 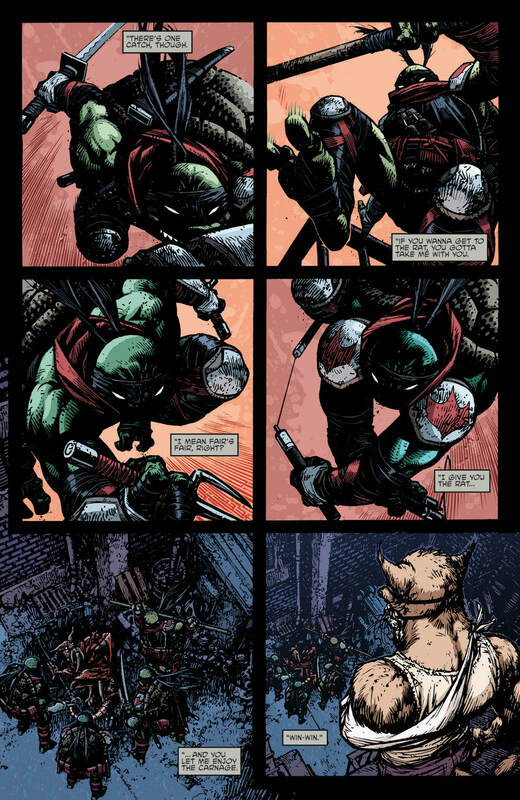 In an era where everybody wants to read a “dark” story with a dark tone, Teenage Mutant Ninja Turtles: Deviations is truly dark in terms of both story and art. That comes with its share of pros and cons. I’d think twice before showing it to a kid who likes the Nickelodeon cartoon. But for adults following this series, this issue is pretty cool. These Deviations one-shots are the IDW equivalent of an Elseworlds or “What if?” story from DC or Marvel. They change a few things within the timeline of a series, and show us how the story unfolds afterward. In the case of Teenage Mutant Ninja Turtles: Deviations, we go back to City Fall. Early in the story, Casey Jones is stabbed in the gut by The Shredder, but survives. This time, he doesn’t. Subsequently, instead of Leo being brainwashed and brought into the Foot, it’s all the Turtles. When we open the story, they’re chasing a desperate Splinter, determined to capture him. But while his family may have abandoned him, Splinter will find allies in unlikely places. I’ve been a Ninja Turtles fan most of my life. As such, the opening sequence in this issue is absolutely heartbreaking. It’s actually half the reason I wouldn’t put this issue in a young child’s hands, because it’s so emotionally brutal. The Turtles are mean, nasty, and blood thirsty toward their father. But he absolutely refuses to fight them. 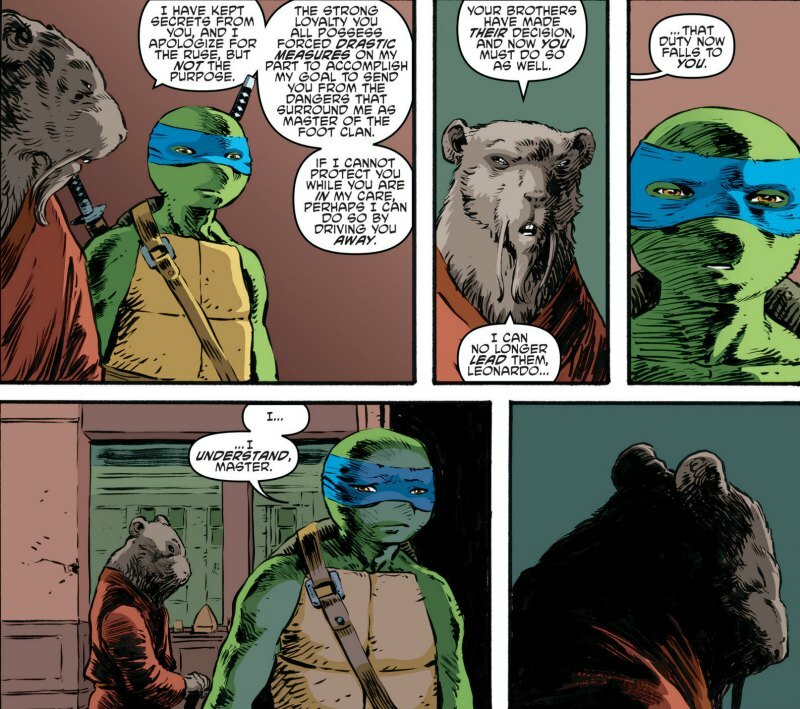 At one point Michelangelo, probably the most heart-on-his-sleeve of the boys, tells Splinter: “We’re not your sons.” In the next panel, we see a tear fall from Splinter’s eye. That’s an amazing character moment for him, amplified immensely by Zach Howard’s art. His eyes are very wide and expressive, almost dog-like. This entire sequence is the creative highlight of the book. The Turtles and Splinter are hardly the only stars here. In this one issue, we also get appearances from Shredder, Karai, Kitsune, Alopex, Casey’s father Arnie Jones, Old Hob, and Slash. They’re not in minor roles, either. They all do their part in adding weight and emotion to the story. They also play a part in adding a significant amount of bloodshed to the proceedings. I won’t spoil things, but a lot of characters die in this issue. So much so that the last page contains a shot of the Turtles standing amongst all the bodies. From a logic standpoint, it’s almost too much. You’re literally left thinking: “Wait, they all died?” It’s a shame. I’d enjoy seeing this timeline revisited at some point, and now they’ve left themselves without a lot of supporting characters. Not all of them get the impactful deaths they deserve, either. Conspicuous by her absence is April O’Neil. Waltz, Howard, and the creative team are somewhat hindered by the page count here. So I imagine it was just a matter of not being able to fit her in anywhere. But being such a close confidant, you’d think she’d have found a way to interject. One character’s death is delivered by Arnie Jones. Again, no spoilers. But I will say it’s both very unexpected and very cool. It’s the kind of moment that reminds you that when you get right down to it, anything can happen in these stories. 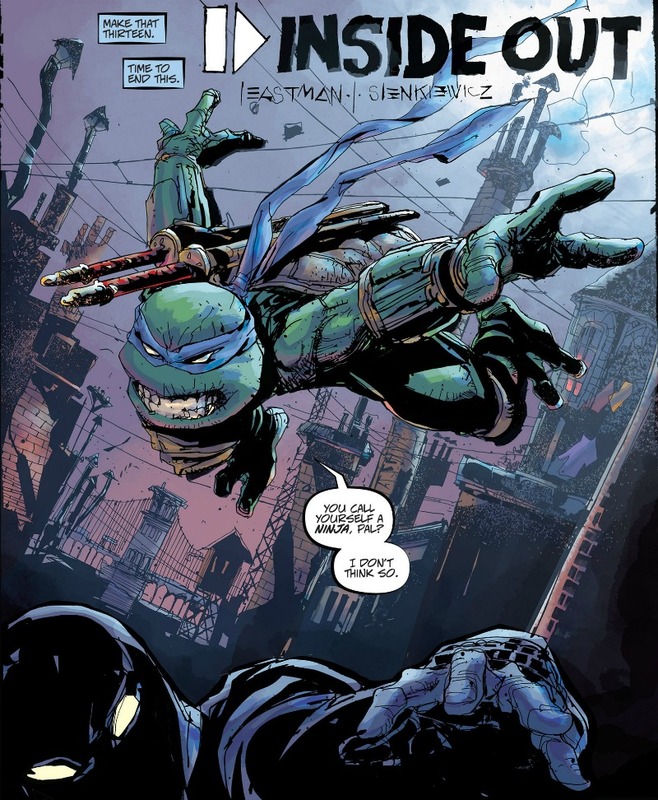 Deviations, to it’s credit, doesn’t look like an average TMNT issue from IDW. Again, it’s dark. It’s much sketchier and more shadowy, especially in that opening sequence. Then at the very end, something happens and the brightness suddenly adjusts. It’s as if a light has suddenly turned on, and it’s very fitting given the events that unfold. It’s a great example of different art styles conveying different tones. Chronologically, the first thing that changes in this timeline is the death of Casey Jones. This issue is hurt by the fact that we don’t actually see Casey die, or the Turtles’ reaction to his death. We also don’t see how the boys are captured, or how they’re brainwashed. This story is essentially missing its first act. Again, the scope of this story is much bigger than the page count allows. I imagine that’s why it seems like so many characters die so quickly. They had to hurry and wrap things up before they ran out of space. 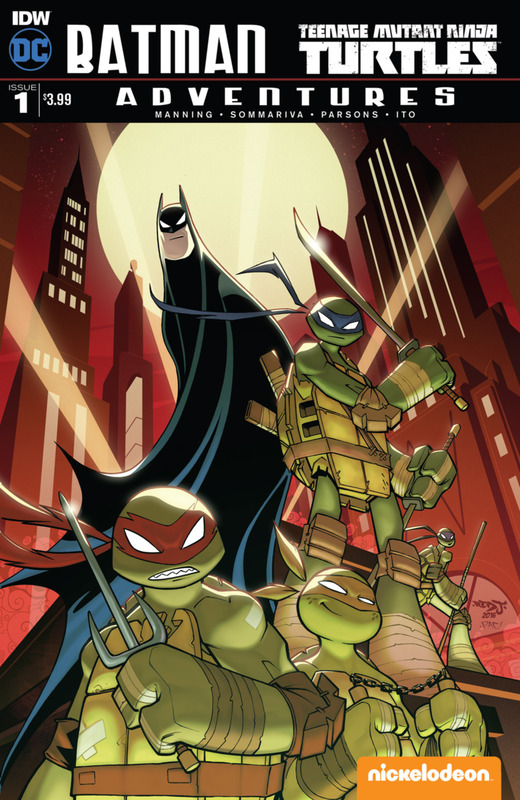 Teenage Mutant Ninja Turtles: Deviations accomplishes its goal. 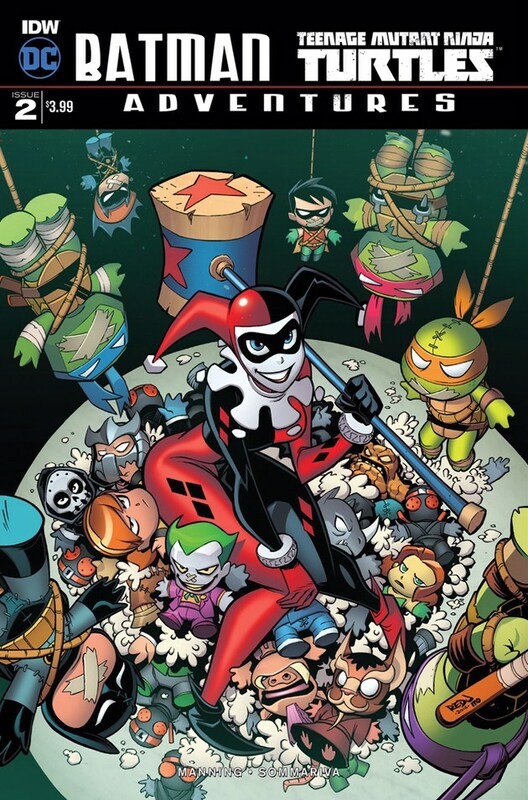 It shows us a different take on the Turtles and their world. It’s not beautiful from a pacing standpoint, but it’s strengths in art and sheer emotional impact outweigh its flaws. They can, and should, come back to this if they can add something meaningful to it. This entry was posted in Wrestling and tagged Casey Jones, comic book reviews, Cory Smith, dark tone, Deviations (IDW), Donatello (TMNT), IDW Publishing, Leonardo (TMNT), Master Splinter, Michelangelo (TMNT), Raphael (TMNT), Rob Siebert, single issue reviews, Teenage Mutant Ninja Turtles, Teenage Mutant Ninja Turtles (IDW), Teenage Mutant Ninja Turtles: Deviations, The Shredder, Tom Waltz, Zach Howard on 04/02/2016 by primaryignition.